To qualify for the Fastnet race each yacht entry & 50% of crew must sail a minimum of 300nm in RORC races including an overnight race. Our SOLers will have to choose there qualifying races from the following events. Race, Date and Distance shown. 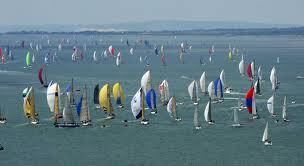 Rolex Fastnet Race 11th August 608 nm. Of the 8 crew onboard Jubilant there must be at least 1 qualified in first aid. 30 % of the crew must be trained in offshore survival. 50 % of the crew must have qualified the 300nm onboard Jubilant.